After serving 12 years as the mayor of Maumelle, Mike Watson decided he would not seek re-election. 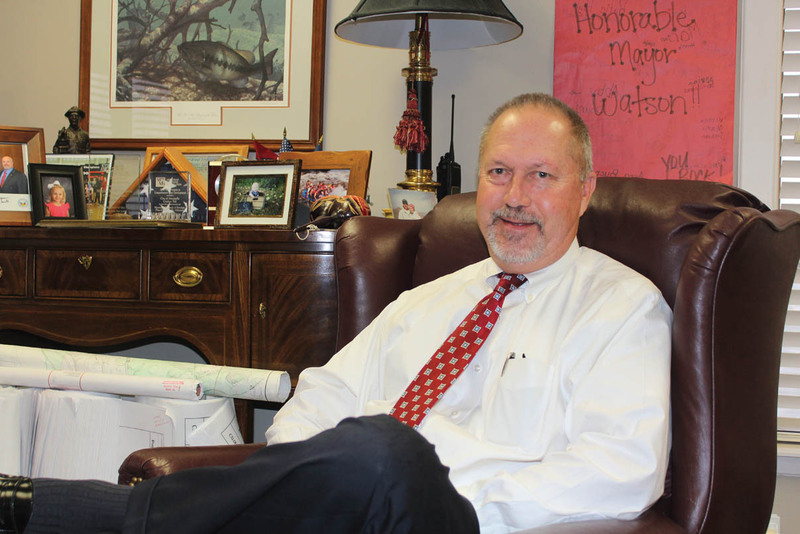 Like any chief executive public servant, Mike Watson captured his share of headlines during 12 years as mayor of Maumelle. But it doesn’t take long to understand just how grounded the Little Rock native is or how pedestrian the issues sometimes are that define a good mayor. “One of the platforms I ran on was, ‘Make a difference in the community,’” he said. “You want to do something every day that makes a difference in somebody’s life or an improvement in our community. You don’t succeed in that every day. Some days you take a step backwards. Watson’s tenure came to a self-directed close Dec. 31. By any measure, his time at city hall was a successful one. Under his watch, the city added services from athletic fields and a senior center to building a police building and two fire stations. Watson credits the citizenry for its willingness to pay for such additions, but his plainspoken, pragmatic approach had something to do with that, too. It’s noteworthy that nearly every city building received improvements over his term except city hall, which would have benefited him directly as the place he reported to work every day. Even in his administration’s closing days, Watson’s modest office told the tale of his time at the city’s helm. Over there, a gleaming ceremonial shovel from a groundbreaking hangs on the wall while a companion stack of plans, reports and maps crowd a tabletop. These highlight arguably his greatest accomplishment, creation of a third Maumelle exit off Interstate 40. The project, which had been sought for more than two decades, finally broke ground in December. No matter how he views it – as a public servant, as the professional land surveyor he is by trade and training or as a resident of this planned community – the accomplishment stands out as the defining one of his tenure. “The first feasibility study was done in 1996 for that interchange,” Watson recalled. “Mayor (Burch) Johnson got some money from the Federal Highway Administration in 2005 … to do the design work. I took that project over, but it took 10 years to get through the environmental process, all the red tape. Given the fact the project dominated his time as the city’s chief executive, one might think Watson would be leaving with a bad taste over the glacial pace of knitting together consensus with state and federal transportation departments, to say nothing of having to sell the citizenry on footing the lion’s share of the bill. Such is not the case. Watson grew up across the river in Little Rock, graduating from McClellan High School. He and his wife, Debbie, moved to Maumelle in 1996, and his public service career began shortly thereafter. He joined the volunteer fire department in 1997 and the city’s planning commission in 1998, serving as the department’s captain for nearly a decade and the commission’s chairman for six of his nine years. Watson’s post-political career will include joining the Little Rock office of Halff Associates, an engineering firm. Absent the endless barrage of mayoral meetings, he’ll also get to spend more time with his wife and growing family that now includes four grandchildren. He’s even looking forward to something as simple as going to church or the grocery store without someone asking for a moment of his time, the general prelude to a much longer conversation. Mostly, he looks forward to the future of the community he loves, having now written his chapter of the history of this place he calls home.